The LED Gaming Headset is equipped with invisible MIC, does not affect the experience of the game or the call. Firstly, please turn on the MIC switch while connecting this headset to your computer, then make sure that your computer MIC switch is turned on. Secondly, please find the "speaker" icon in the computer task bar and with Double-Click to enter to set the Volume, and lastly in the "Control Panel" where you can input "Sound" to set. 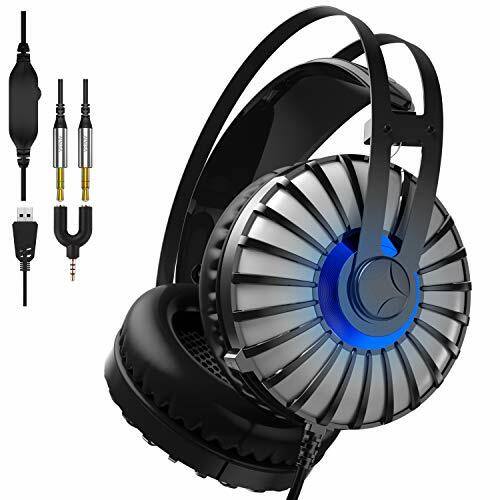 7.1 Surround Stereo Sound System : With 7.1 surround stereo sound system and high-quality resolution, this stereo gaming headset surprisingly enhances your 3D hierarchy in the game. Besides, with precise audio positioning , you can accurately make a judgement and decision. Metal Titanium-Film Loudspeaker : Equipped with metal titanium-film loudspeaker and noise-cancellation MIC, which precisely present you the BGM, footsteps, firearms. This gaming headphone is not only a headset but an experience. Confidence and Excellent Customer Service: Each of our A50 Gaming Headset is manufactured according to the professional process, so there is no worry for you to order this Headphone. If you have any problems with using it, you can E-mail us, and we will help you out in 24 hours. Besides, you will get an ONE-YEAR warranty for A50 Gaming Headset! Thanks for browsing this product! If you have any questions about this product by AINISA, contact us by completing and submitting the form below. If you are looking for a specif part number, please include it with your message.